In the spirit of throw backs, today being Thursday, I decided to blog about a mission I went on earlier this month. That should count as throwback yea? You see, I am your convenient type of girl. If something suits me I can stay on it forever. I don’t go trying new things, especially if it’s not detrimental to work, family etc. In foreign places, I don’t experiment with food. If there is no rice, chips, chicken, I unleash my garri. I don’t go snorkelling, sky diving, and what have you. I sleep, watch movies, read then sleep again. So this last holiday, I decided was convinced to explore more than I usually would. I was interested in going to the water park. I really just wanted to kiss a dolphin, play in the water and head back home, but I was convinced by greater forces (I am talking to you Seye) to go on the water slide. So I decided to give it a shot. This was after changing my mind like 30 times. Now, down was a pool. But with the shape of the slide, you couldn’t see the pool. 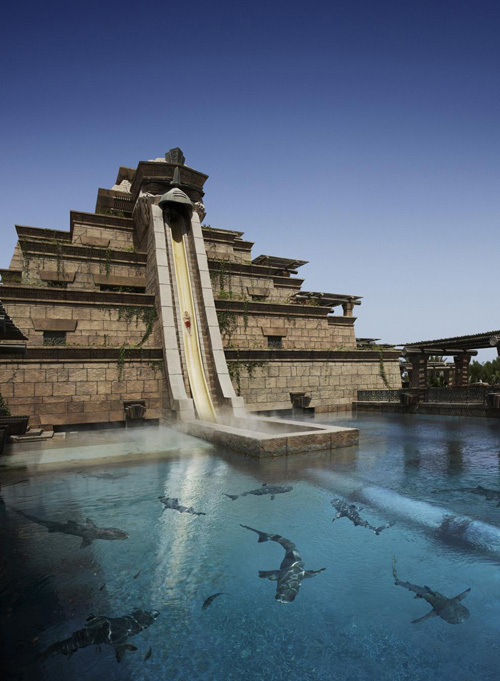 You slide all the way from the top and believe the pool was there to crash into. The pool was below the floor where the shark tank was. It is one of the scariest things believe me. 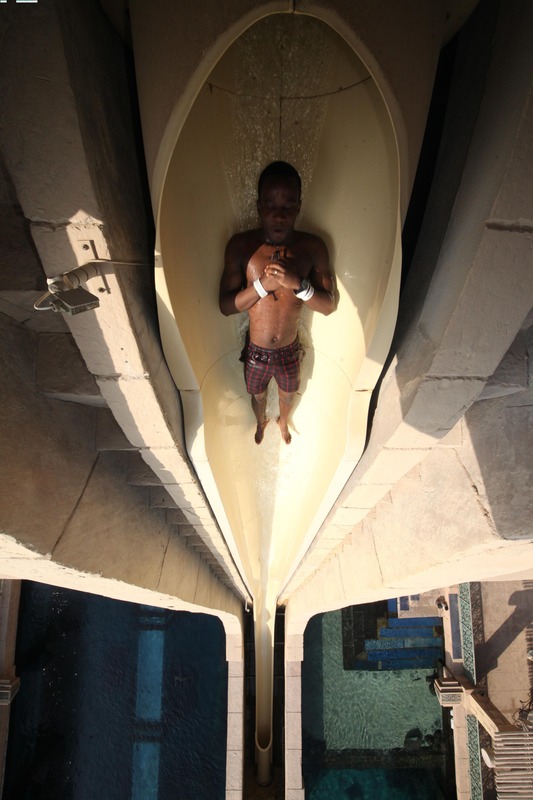 Funny part is: the moment you lie in the slide, there’s no turning back. The water sweeps you, Literally. Writing about it now, I still feel my heart gripping like that day. And whewsssssssssshhhhhhhhhhhhhhhhhhhhSplashhhhhhhhhhHHHH I went. I was thrown from the top of a building to go and land in water, hopefully. The slide didn’t last more than 8 seconds, probably even less, but it felt like 8 minutes. I screamed, oh my I screamed. In retrospect now, I know why I screamed that much. 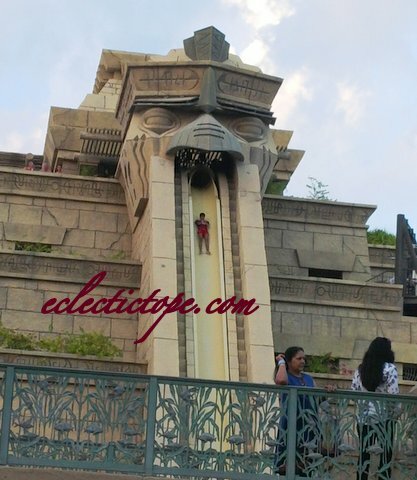 For me, fear crept in just before I lay in the slide. And because of that fear, I unconsciously uncrossed my arms, then I suddenly remembered the instructor said cross your arms till you get down. By this time, I felt a heavy splash, and then so much water around me, and my first thought was that I had landed in the shark tank. I assumed that since I had uncrossed my arms contrary to instructions, I had somehow managed to end up in the shark tank. You would not believe how much thoughts went through my head in those few seconds. I started struggling in water. It felt like hours. And then suddenly a board swept towards me, and it was all over. Now this is where the story gets interesting. You see, by the time I felt the heavy splash, I was actually already done. I was in the pool, but didn’t realise it. The pool was only 1.5m deep which means there was no need to struggle in the water. All I had to do was slide down and get up. But fear didn’t let me. Fear didn’t let me realise that I had leaped and actually even gotten to a safe place. I probably assumed it was too short a time to have gotten to my destination, it definitely had to be the shark tank. It was afterwards I understood why they had named the slide Leap of Faith. And that’s the thing with many of us. We want to jump, we want to fulfil dreams, we see it already, somewhere in the distance, but fear. Fear of the unknown. Fear that we would get caught up. Fear that we would miss instruction. and not do things right. The shark tank was there quite alright, but it was in a space of its own, it had no connection to the water slide. If you wanna leap by faith, you can’t be scared of anything. You just have to trust that you’ll be ok, that God would carry you incase of any emergency. That though there might be obstacles on the way, you can leap over them. They can be ON the way but they can’t stand IN your way. That TRUST is what gets you to the other side believe me. As long as you keep reminding yourself that there is another side, a safer side, you’ll get there. That positive energy is all you need. Fear cripples everything pretty much. So go ahead, and LEAP. I thoroughly enjoyed reading that piece! Didn’t even realize that I was holding my breath…. I love your choice of words and that was a really deep message! Yes, sometimes our only stumbling block is in our mind. Sadly, the “block” becomes so real and big and it hinders us from being our best and enjoying life. Considering the fact that you are a “convenient type of girl” and having heard glowing things about you from Oyinkan Miel, I am counting down to meeting you…..